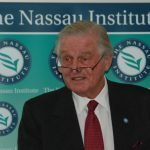 This presentation was made to The Rotary Club of East Nassau, Friday, August 17, 2012, and is posted here with the kind permission of the author. Earlier this year I attended a talk by Kiril Sokoloff in Lyford Cay. Kiril is one of the world’s foremost fund managers. Some of you might have been there. He painted a very clear picture indeed of the economic railway-to-hell upon which the world seems to be travelling. Yet, the telling moment came with the questions and answer period. Virtually everyone wanted to know how best to keep their first class seats on this railway-to-hell. Not one question was raised about how to stop the train or how to ‘turn the tanker’ to use another analogy. They just wanted to know how best to tie up their camels. according to St Louis Federal Reserve Board data. By that gauge this recession is proving more intractable than the Great Depression. Five years on it is clear that U.S. subprime fiasco was merely the first bubble to pop, a symptom not a cause. Europe had its own parallel follies. Britons were extracting almost 5pc of GDP each year in home equity by the end. Spain built 800,000 homes in 2007 for a market of 250,000. Iceland ran amok, so did Latvia and Hungary. The credit debacle was global. If there was an epicenter, it was Europe’s €35 trillion banking nexus. Monetarists blame the ECB and the Fed for keeping money too tight in early to mid-2008, pushing a fragile credit system over the edge. They blame “pro-cyclical” regulators for aborting recovery ever since by forcing banks to raise asset ratios too fast. Yet the `Austrian School’ is surely right to argue that a rise in debt ratios across the rich world from 167pc of GDP to 314pc in just thirty years was bound to end badly. There comes a point when extra debt draws down prosperity from the future. The future arrived in 2008. If all three break the limit together, the system loses its shock absorbers. “Debt is a two-edged sword. Used wisely and in moderation, it clearly improves welfare. Used imprudently and in excess, the result can be disaster,” he said. Creditors and debtors may in theory offset each other, but what actually happens in a crunch is that borrowers cut back feverishly. Creditors do not offset the effect. The whole system spins downwards. It is debt’s fatal “asymmetry”, long overlooked by New Keynesian orthodoxy. A pretty grim picture Ambrose Evans Pritchard has painted indeed! We have all felt that same contraction here. Many today look hopefully for the recovery which normally follows a downturn. I am not amongst those. I don’t see how it is possible to borrow one’s way out of debt. I also see the dangers of printing money. New money, whether borrowed or printed can, of course, cause increased spending. “Green shoots” might appear. Yet, they cannot last more than a moment. Without further borrowing or printing the increase is soon lost. Only the increased burden of debt or the reduction in value of money remains. To me that’s simple common sense. This may all sound frightening. It really isn’t. Let me explain. To most people problems of the world economy seem a very complex and inexplicable matter. Many may feel they are not smart enough to understand or deal with its complexities. Yet, anything that is complex is merely an assembly of simple things. So, if your one of those who does feel this way, please don’t shy away. Let’s look at the simple things and see how they are assembled. You will be surprised at how elementary this mess really is. We really ought to ask: why did the credit bubble happen in the first place? To answer the question, let’s look at the basic structure of the banking system. Let’s look at how it actually works, not at how we are taught to think it works. For that purpose, let’s suppose I open a new bank today. Let’s also suppose its 1900 when a gold sovereign was a valid unit of money and further suppose that you are my first depositor. You lodge your gold coin with me for safekeeping. Now you can use your gold coin safely in the marketplace. Mike Lightbourne then comes to see me. He wants to buy Donny’s car but he is one gold coin short of the price. Mike’s credit is good. He is an upstanding individual and I trust him to repay. I lend him the gold coin. Mike then buys Donny’s car and Donny now has the gold coin. Donny then becomes my second depositor and lodges his gold coin with me for safekeeping and I give him a receipt and a cheque. These are perfectly normal everyday banking procedures. Yet, what is my position? I have ONE gold coin BUT I HAVE ISSUED TWO RECEIPTS AGAINST IT. But, as you don’t both come at the same time, I can then lend it again and again. It makes no difference if the coin is deposited in another bank. The receiving bank will issue a new claim on the coin and then the entire banking system will become part of the fraud. When we look at the banking system as a whole, as each new loan is issued and each new receipt is created, the “value” of each receipt issued by every bank diminishes. For instance, if there are five gold coins in the system and twenty receipts have been issued, each receipt is actually worth one quarter of a gold coin – not a full gold coin. When the market became aware of this, it would expect to receive four receipts in exchange for what it had previously required only one receipt. That’s all there is to inflation. It’s not rocket science. Are you with me at this point or are there questions you would like to ask now? Banks make new loans every day. The creation of new “money” continues daily and the value of money diminishes daily. By 1904, it took 20 dollars to equal one ounce of gold. By 1933, it took 35 dollars to equal one ounce of gold. By 1968, it took 43 dollars to equal one ounce of gold. The above prices were all restrained by official edict as to the convertibility of gold. In 1971, President Nixon freed all restrictions and the process of revaluation began in earnest. By 2004, it would have taken 2800 dollars to equal one ounce of gold. By 2012, it would take 8500 dollars to equal one ounce of gold. The rate of debasement is increasing. With the current market price of near 1600 dollars, you can see how far the market has yet to go to catch up with reality. ‘How can this process be allowed to continue?’ you might well ask. In 1811 a judge in the U.K decided that the instant you put your money into a bank, title to that money transfers from you to the bank. That made your deposit the bank’s money and they could do what they wanted with it. That decision was challenged in 1848 and the reviewing judge upheld the decision. It has remained unchallenged since. So, by legal precedent, your deposits now legally belong to the bank – not to you. Therefore, legally it is no longer a fraud. BUT THE FRAUDULENT MECHANISM REMAINS and, as we saw earlier, the debasement of money continues at an astonishing and increasing rate. So, how safe is your deposit in the bank? Following these legal decisions you are no more than an unsecured creditor of the bank. The deposit that you think is yours is not yours. It belongs to the bank. The bank may owe it to you, but secured creditors have first call upon the money you believe is yours. That may surprise you, but it is fact. It deserves thinking about. You may be under the impression that your deposits are guaranteed. Certainly, in the case of the FDIC in the US, the FDIC does not have sufficient money to guarantee all deposits. So, what is the truth behind your guarantee? As it stands now, all of the money in the country that is not in circulation – i.e. : in your pocket, handbag or in a cash register – all the rest legally belongs to the banks. They control it and that gives them both power over those that need money for investment or consumption. It is banks which ultimately determine what will and what won’t be financed. This transfer of ownership also deprives you and gives them an enormous source of income. Unsurprisingly, banks must account for each penny deposited. They must show that every penny deposited is offset with an investment of at least the same amount. As a result, they are limited to lending money. They are not permitted to invest in shares. This is because loans are stated in terms of an exact amount of money. Thus, they can document the offsetting balance exactly. Shares are stated in terms of an exact percent of a company – not a fixed amount of money. Their value can fluctuate in terms of money. Thus, all of the money in any economy which is not in circulation and which banks invest, must be invested as loans. As cash in circulation is usually less than 4% of the money supply, more than 90% of the money in banks is loaned. That is why most economies have become dependent upon debt financing. Now, can you see why the world is in heaving in debt and why the entire world economy has slowed under its burden? It is this burden of debt that underpins your deposits. At the root of all of this mess lies the money-lending-mechanism of the banking system. It is worldwide. Banks throughout the world lend to one and other. The interbank debt structure is the prime source of economic threat. When European banks go bust, they call the loans they have made to other banks, threatening the other banks. This mechanism and its continued production of new receipts, after many revaluations, finally destroyed the gold standard in 1971. No currency after that was freely exchangeable for gold. That left depositors dependent on Central Banks as lenders of last resort. By 2007/2008 this mechanism had also destroyed the Central Banks’ ability to act as lenders of last resort. Taxpayers had to be called upon to save the system. So, now the depositors – who are also the taxpayers – are guaranteeing their own deposits. To answer our earlier question: you are guaranteeing your own deposit. Surely this is a nonsense! Where do we go from here? There are no further fail-safes. That is why I am confident we are now living through the end game of the paper money system as we know it. What will this end game look like? I suspect both governments and central banks will print more and more money attempting to save the unsaveable and money – like in the German Mark in 1923 – will become valueless. Or, banks will begin again to go bust – as Northern Rock and Lehmans did in 2007/2008 – and then the entire house of cards will collapse. Throughout the world, depositors will be lucky to recover a fraction of their deposits. Our Bahamian banks are also threatened. As they stand, they cannot avoid the storm. They, too, cannot meet all withdrawals at the same time. People will withdraw their money as the collapse advances. Bahamian banks have also become involved in lending between banks, each of which now has first call upon your deposits. So, your deposits will be under threat. This is why twice within the past year I have spoken publicly here in the Bahamas, about changing the system to protect our banks and our currency. It is not difficult to achieve. All we need to do is to get the government to enact legislation returning title of their deposits to depositors. Then banks cannot touch your deposits without your authority. Banks will have a fiduciary responsibility to each depositor. I have drafted legislation for that purpose in England. My friend, Lord Caithness has already introduced such legislation in the House of Lords in 2008. It died a natural death then. No-one wanted to know. Now people are becoming more aware. Lord Caithness intends to re-introduce his Bill this autumn. We intend to continue fighting. Similar legislation could be enacted here. Our British Bill could serve as a useful template. Once passed, it is not difficult to reorganize the financial system so that every deposit is fully covered by cash. Then every depositor can make his or her own decision about where their money will be invested or spent. It will no longer be up to the bank manager to do anything but to ensure that your money is 100% safe and it is efficiently distributed according to your wishes. Your deposits will then be 100% safe. It is the money-lending mechanism of the banking system that has brought us to this end game. It is the money –lending mechanism that is destroying capitalism. It can be stopped in one move: RETURN TITLE OF YOUR DEPOSITS TO YOU. That is how we turn the tanker! Please think it through and join with us this fight. I urge you to do what you can to bring about this legislation here in the Bahamas. When enough people set the right example, their leaders will follow.